Many of us live in Wisconsin because we enjoy the climate. Warm summers, cold winters and the transitions of spring and fall lend variety and beauty to our lives, and are the engines that drive our prosperity. Climate also affects many aspects of Extension work, and changes in Wisconsin’s climate can have substantial implications for many Extension stakeholders. 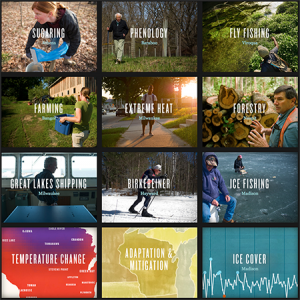 UW-Cooperative Extension Climate Portal – These webpages provide information, education and teaching resources to support Extension faculty working to make Wisconsin’s communities safe and prosperous. Climate Ready Communities Initiative – This program is designed to assist communities in assessing and managing their vulnerability to extreme weather.